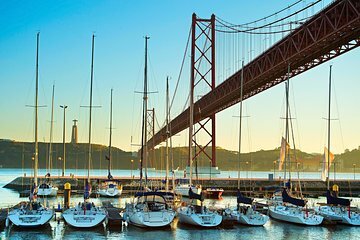 See Lisbon's highlights from the water during this 4-hour private boat tour on the Tagus River. Visit both banks of the river and see important landmarks such as Torre de Belém and Padrão dos Descobrimentos. Welcome drink of wine, beer, gin, or juice included. This private tour ensures personalized attention for you and your party. Make your way to Doca do Bom Sucesso in Lisbon at your chosen departure time of 12pm or 4pm. Once you step on board the vessel, your private party will be welcomed by a drink of your choice: beer, wine, gin, or juice. Bar service and catering options are also available on request. You can jam to the on-board sound system and even bring your own playlist if you like. Head up the Tagus River, gliding by the monument built for the 1940 Portuguese World Exhibition, the Padrão dos Descobrimentos (Monument to the Discoveries). Next, pass the Torre de Belém (Belém Tower) on the way to the south bank to see forts and prisons used during the old regime. Heading for the statue of Cristo Rei, pass under the Ponte 25 de Abril, formerly known as the Oliveira Salazar Bridge. Return to the north back to see the recently revitalized waterfront, the Cais do Sodré neighborhood, and the Terreiro do Paço. Pulling back into the dock, you'll see the impressive Museum of Electricity. If the weather is nice, you may even get to dock at a local beach for a swim.